Buy one pack and get another one FOR FREE! 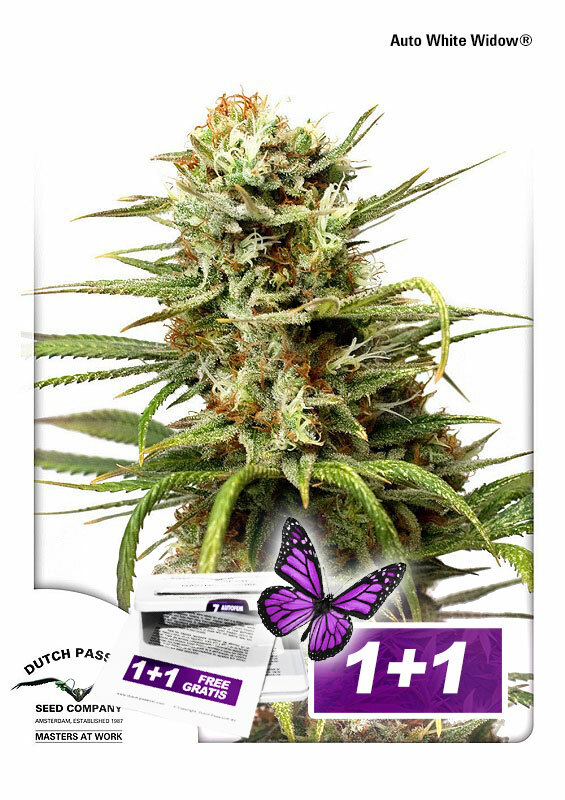 After several years of careful selection Dutch Passion are pleased to introduce our special Auto White Widow® Cannabis Seeds. This is the long-awaited automatic version of our best-selling original White Widow. Auto White Widow® is a vigorous and strong auto which gives a powerful high, she was produced from our original White Widow mother plant using the same genetics which have won countless awards and satisfied thousands of growers. Auto White Widow® is very consistent and easy to grow with any grow method. Our automatic version is ready to harvest around 75 days after germination and will yield outdoor 50 to 150g+ of cannabis from a single plant. Experienced indoor auto growers will be able to harvest 200g+ from a single plant, especially when grown in hydro Deep Water Culture systems. Plants reach around 60cm to 1m tall. The taste is fresh, citrus pine, fairly sweet and strong, and the effect is fast. Auto White Widow® Cannabis Seeds produce bushy and frosty plants with numerous blooms. She produces strong aroma’s during growth and dense hard buds. The high is a well-balanced and pleasurable one, combining a powerful cerebral impact with a relaxing physical effect – extremely pleasant. AutoWhite Widow is one of the best auto’s we have developed and is highly recommended for those looking for an easy-growing and powerful auto with generous yields. I run this baby in 1.2 x 1.2 x 2 tend box made from HomeGarden company. First time put them from seed to harvest on 24/7 light no darknes time and put them 600w HPS in Xtrasun air cooled tube in 6l pot with soil growmix (Plargon) and feeding them with AN senssi blom AB, Big Bud and flush with tap wather last week. They needed 90 days from seed to harvest, probably becouse of stress. They get energy all the time, and on the end produce abnormal yield. Never seen before. Amazing 24/7 works but not for everyone. You realy keep eye on them becouse the temp can make some problem but air condition is saving everything. input air is the key. Thanks again Dutcs Passion, probubly you don t even amagion what your autflower seed can do. Good strain. Bought a few months ago during the buy 3 get 3 free promo. I suspect the seeds are actually CBD Widow since I get a powerful calming effect with low anxiety and paranoia. It's been extremely effective for me medicinally. I wanted to try a CBD strain and maybe I just got high CBD phenos...who knows. All I know is this is lovely, sweet bud that keeps me pleasantly calm and has actually improved my quality of life significantly! Does someone know how big they get when grown outside in a warm climate like the iberian peninsula? Weet iemand hoe groot ze buiten worden, in een warm klimaat zoals in het iberisch schiereiland? my plants are 23 days into bloom and the buds and leaves are already covered in a visible layer of white trichomes (naked eye) with 7-8 weeks still left to go, how is this even possible? this is some insane trichome production. unbelievable!!! Hello . I would like to know what is right pH correct temperature . Thanks. which size of pots are recommended for most autofem plants? what is minimum space for growing 4 auto white widows? My space is 60cm with 60cm, I am not sue if it is enough. i want to grow the autowhite widow and its my first time but i dont know what else i need like soil and how big the pot needs to be and what plant food to feed the plant for best results and more buds. This is the best auto strain I've grown. The weed was frosty, good smell and strong, I would recommend it and if I do another auto grow this will be the one. Hi Pavla Cerna, The caps are out of stock unfortuantely. But you can try to contact one of our ditributors.